I was impressed this morning when I reviewed the technical aspects of the Register' s coverage. To be sure, it had a professional partner in Iowa Public Television (IPTV). That brought expertise the Register likely didn't have entirely on its own. In a nutshell, here's what the Register offered today beyond print: Lots of easily accessible video and useful background documents on the issues being debated. The paper didn't just post one long video viewers would have to fast-forward to get to issues of interest. Instead, the Register and IPTV sliced and diced the video into 28 separate segments, organized by issue. Then they published all 28 on the Register's website and IPTV's YouTube page -- all in time for this morning's paper! So, for example, former Massachusetts Gov. Mitt Romney (left) was asked by Register editor and debate moderator Carolyn Washburn about the economic impact of global warming. The paper provides both his taped response and a link beside it, taking readers to a Register issues database, where they can compare candidates. The organization is reader-friendly because it lets voters more easily "shop'' the website for issues, and the candidates' responses. That's simply good First Amendment journalism. Of course, the competition isn't far behind: The New York Times offered an impressive video presentation of its own this morning. Reviews of the debate were mixed. 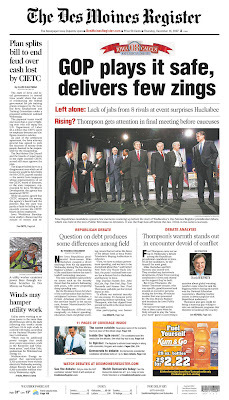 The Washington Post called it "lackluster.'' But The Politico, a new Web entry in political coverage, was impressed. "Carolyn Washburn, editor of the Des Moines Register, asked all the questions and did so in a manner that suggests she believes a presidential debate should be more about information than entertainment,'' Roger Simon says. "That is a staggering concept and one that some reporters may not have liked -- there were few of the fireworks that fuel juicy story lines -- but I have a feeling serious voters, which the Iowans who vote on caucus night are, got a lot out of it." Here's Washburn in her introductory remarks; as you can see, because the Register provided the embeddable code for its videos, I'm able to past them on this blog -- extending the paper's coverage (and its brand) well beyond Iowa.